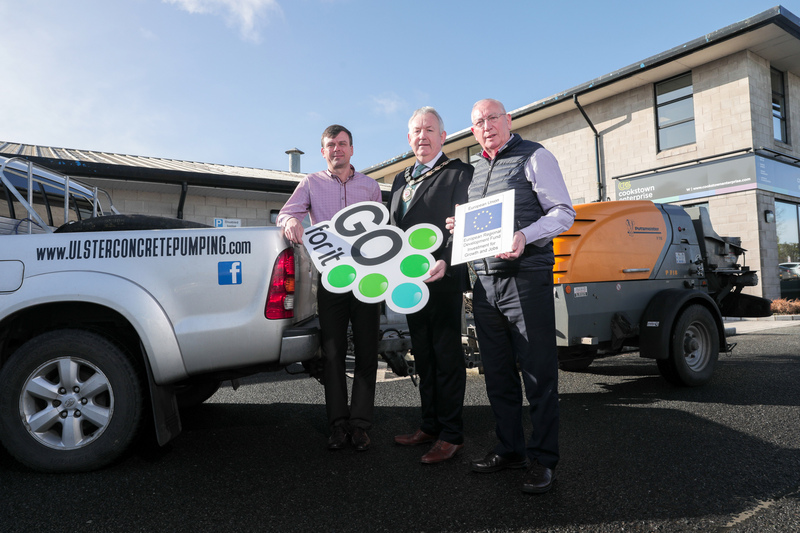 Well done to our Go For It client Serghie who spotted a gap in the local market and went on to establish a very successful, innovative business Ulster Concrete Pumping. Go For It delivered in Mid Ulster District Council by Cookstown Enterprise helped Serghies business idea to get up and running and he has already surpassed his initial financial projections! Serghei Hamchevici, originally from Moldova, made the life changing decision to turn his back on long-term employment and chase his dream of running his own business, after spotting a gap in the market for a specialist concrete pumping company. Serghei launched Ulster Concrete Pumping in May 2018, after going through the Go For It Programme and raising the necessary capital required to purchase a specialised mobile concrete pump. With less than one year of trading under his belt, Ulster Concrete Pumping is operating ahead of projected sales estimated in the business plan which Serghei refers to as his ‘route map’ to monitor the progress of his business. “Without the Go For It programme, turning my idea into a feasible business would not have been possible, their help and support was essential. I sat down with my business advisor from Cookstown Enterprise Centre and they helped me to put together my business plan. We looked at everything from finance to forecasting. It really opened my eyes to what was involved. The Go For It Programme is delivered free of charge by a team of experienced business mentors through Northern Ireland’s wide network of enterprise agencies. It provides expert advice and help to develop a business plan, helping entrepreneurs turn ideas into commercial businesses. “I was delighted to meet Serghei and hear about his thriving new business, he is clearly reaping the benefits of support from the Go For It programme. Mid Ulster has a strong entrepreneurial culture and it’s one of the Council’s strategic priorities to help maximise opportunities to create and grow district wide businesses and investment. I wish Serghei every success in growing his new venture”. “Serghei knew exactly what he wanted to do and the equipment he needed to make it a success. His Business Advisor, Shauna Rooney, mentored him in the process of preparing a business plan, focusing on areas such as market research, financial planning and marketing. If you have a business idea you’d like to develop or if you are thinking about starting a business contact the Go For It team on 0800 027 0639 or visit: www.goforitni.com.